A regular breeding resident and migrant. The Northern Parula was a common species during the Minnesota Breeding Bird Atlas (MNBBA). Found exclusively in the forests of eastern North America with two broad populations, one in the northeastern and upper midwestern United States and Canada and the other in the southeastern United States (Figure 1). The highest densities occur in Nova Scotia and in northwestern Florida. Short to long-distance migrant that winters in southern Florida, the Caribbean, Mexico, and northern Central America. Nests at variable heights in trees, where it hollows out its nest within the epiphytic hanging moss. Breeding distribution and relative abundance of the Northern Parula in North America based on the federal Breeding Bird Survey from 2011 to 2015 (Sauer et al. 2017). Roberts (1932) stated the Northern Parula was “a summer resident throughout the northern coniferous forests, where it breeds as far south as northern Isanti County and as far west as Itasca Park and eastern Polk County.” He noted nesting activity in Becker (nest with eggs), Itasca (feeding young in nest), and Pine (“young of the year with parents”) Counties, as well as at Cass Lake (feeding young) and Itasca Park (feeding young). Descriptions within these areas indicate it was a common species. For instance, Roberts described it as “by no means uncommon” at Lake Itasca in the summer of 1902,” “the commonest warbler around Gull Lake, Crow Wing County, nesting in tamarack and spruce swamps,” “at Cass Lake, in June and July, 1916, a field party from the University Museum found it fairly common and feeding young out of the nest,” “fairly common in northern Itasca County in June 1923,” and summarizes “it may be detected in almost every suitable locality by the sharp-eyed and quick-eared observer.” The latter suggested the species was easily overlooked because it can be difficult to find foraging or singing in the trees and because observers are potentially unaware of its song. Green and Janssen (1975) described the breeding distribution of the Northern Parula as primarily in the northeastern and north-central regions of the state. They emphasized that it was sparse in the northern portions of the north-central region and concur with Roberts that its western distribution is limited to central Polk County. Confirmed or inferred nesting beyond those reported by Roberts included Aitkin, Cook, Crow Wing, Hubbard, Lake, and St. Louis Counties. Several years later, Janssen (1987) documented confirmed nests in 5 counties since 1970: Cass, Clearwater, Cook, Hubbard, and Lake. He also emphasized that the species’ distribution in the northwestern portion of the state was not well known. In 1998, Hertzel and Janssen added no additional nesting records for this species confirmed since 1970. The Minnesota Biological Survey included 524 breeding season locations and largely confirmed the breeding distribution previously described (Minnesota Department of Natural Resources 2017). They also confirmed the sparseness of the species in the northwestern region and included no locations from that region. They recorded many locations from Becker and Mahnomen Counties in western Minnesota, plus two more “southerly” locations in Carlton County and one location in Pine County near the Wisconsin border. The MNBBA included 1,388 breeding records and confirmed the difficulty in finding nests of this species. Only 16 blocks were identified with confirmed nesting; a meager 2.4% (16 of 676) of all the blocks where breeding evidence was detected (Figures 2 and 3; Table 1). This is partly due to the patchy nature of the Northern Parula’s breeding habitat and the difficulty of definitively observing the species in a nest placed high in a tree covered in moss. The Northern Parula was recorded in 14.3% (676 of 4,735) of all blocks and in 16.9% (396 of 2,337) of the priority blocks. The MNBBA confirmed nesting of the Northern Parula in five counties: Aitkin, Cook, Lake, Itasca, and St. Louis Counties. Its distribution was very limited in the northwest and western regions, confirming Janssen’s suspicions. No observations were made in Polk County, where Roberts had reported its presence, but probable nesting was recorded in Becker County as well as several possible records in the “northwest angle” in Lake of the Woods County. In addition, possible nesting was identified in northeastern Morrison County, and two possible nesting detections were recorded in Pine County. The predicted probability map based on MNBBA point counts indicates the primary distribution of the Northern Parula is in the extreme northeastern regions of Minnesota, especially in Cook County (Figure 4). Smaller, isolated populations are also predicted across much of northern and north-central Minnesota as far west as Becker and Otter Tail Counties and northwest to eastern Roseau County. Roberts described the breeding distribution as far south as Isanti County and as far west as Polk County, so it appears the breeding range of this species has retracted since the early 1900s. This is likely due to reductions in forested habitat, especially riparian floodplain forests with suitable hanging moss for nesting. Breeding bird atlas results in Wisconsin (Cutright et al. 2006) indicated a similar pattern of range contraction due to apparent habitat loss. However, Chartier et al. (2013) in Michigan indicated the species had increased and expanded its range from its first atlas of 1983–1988 to its second atlas of 2002–2008. Results between the first and second atlases in Ontario also suggest an increase in Northern Parula populations, but Cadman et al. (2007) was cautious about the validity of the increase because of the lack of confirmation from the Ontario Breeding Bird Survey roadside counts. Moldenhauer and Regelski (2012), in their review of the Northern Parula in North America, stated this species had largely been extirpated or reduced in numbers as a nesting species in several northeastern states. These range contractions were purportedly due to air pollution and limited growth of epiphytes that the species uses for nesting. They also point out that habitat loss in southern Michigan and Wisconsin primarily due to agricultural and urbanization expansion had severely reduced available habitat in those states. Range expansions, however, were reported in Tennessee and North Carolina, plus recolonization of New York State was reported from 1985 to 2005. Overall, it is difficult to draw firm conclusions regarding changes in the distribution of the Northern Parula in Minnesota. Roberts (1932) only reported the species as a migrant in southern Minnesota and suggested its breeding range was limited south to Isanti County. Therefore, its breeding distribution is likely similar to the past, but the ability of early explorers to identify the species and its patchy nesting requirements in epiphytic moss may have rendered it easily overlooked. Cadman et al. (1987) also suggested the species is very easily overlooked because of its quiet song, especially when heard among a chorus of other actively singing birds. Breeding distribution of the Northern Parula in Minnesota based on the Breeding Bird Atlas (2009 – 2013). Summary statistics of observations by breeding status category for the Northern Parula in Minnesota based on all blocks (each 5 km x 5 km) surveyed during the Breeding Bird Atlas (2009-2013). Summary statistics for the Northern Parula observations by breeding status category for all blocks and priority blocks (each 5 km x 5 km) surveyed during the Minnesota Breeding Bird Atlas (2009-2013). Predicted breeding distribution (pairs per 40 hectares) of the Northern Parula in Minnesota based on habitat, landscape context, and climate data gathered during the Minnesota Breeding Bird Atlas (2009-2013) using the General Linear Modeling method with an adjustment for detectability. The Northern Parula nests in tall, mature coniferous forests, primarily with spruce, hemlock and fir, where moss is abundant, such as in riparian, floodplain, and wet areas (Moldenhauer and Regelski 2012). Since hemlock is very rare in Minnesota, tamarack is also frequently used. In Minnesota, Collins (1981) suggested, the species primarily uses undisturbed mixed forest of deciduous trees with more than 75% canopy cover. Based on over 2,000 detections during the breeding season, the National Forest Bird (NFB) Monitoring Program indicated significantly higher use of mature aspen-spruce-fir and mixed swamp conifer forests (e.g., white cedar, black ash, and spruce) compared with other forest cover types (Niemi et al. 2016). These habitats are frequently found in riparian areas adjacent to creeks, streams, rivers, wetlands, ponds, or lakes (Figure 5). Lowland hardwood forests were also used. The MNBBA point count data showed the species’ primary use is associated with mature forest cover types such as upland coniferous forests, pine forests, and northern mixed deciduous-coniferous forests (Figure 6). Cadman et al. (2007) emphasized the Northern Parula reportedly also “use dry pine or hemlock forests in which Usnea is rare or absent, particularly forests near lakes or other water bodies.” Interestingly, Hatch (1892) stated, “Notably this bird mostly avoids damp, dark swampy localities, and is found on high, dry, and even hilly places.” Both of these comments seem counter to the prevailing knowledge of the species’ breeding habitat, but perhaps the species is more flexible, especially when suitable moss is not available. Few data have been reported on the species sensitivity to forest fragmentation. Freemark and Collins (1992) indicated that the Northern Parula is area-sensitive because it is uncommon in small forest tracts. Even though Morse (1989) found that the species uses small islands and prefers to nest on the edge of these islands, Robbins (1979) estimated that 520 acres was required to sustain a viable breeding population in Maryland. Blake and Karr (1987) only found the species in forest islands of at least 160 acres or more in Illinois. Niemi and Hanowski (1992) classified the species as area-sensitive for their studies assessing the effects of increased forest harvesting and management in Minnesota. Typical breeding habitat of the Northern Parula in Minnesota (© Gerald J. Niemi). Habitat profile for the Northern Parula based on habitats within 200 m of point counts where the species was present during the Minnesota Breeding Bird Atlas (2009-2013). Partners in Flight (Rosenberg et al. 2016) estimated a North American global population of 17 million breeding adults. MNBBA estimates indicated a breeding population of 1.07 million adults in Minnesota (95% confidence interval was 0.92 – 1.50 million), which was much higher than the Partners in Flight Science Committee’s (2013) estimate of only 200,000 breeding adults in the state. The discrepancy between these two estimates may be due to the lack of sampling by the federal Breeding Bird Survey (BBS), which was used for the Partners in Flight population estimates. The BBS did not sample roadless areas of Minnesota such as in the Boundary Waters Canoe Area Wilderness (Figure 4). These two areas were sampled by MNBBA point counts. Population estimates for Canada ranged widely from 500,000 to 5 million adults (Environment Canada 2011). BBS trend estimates indicate a significantly increasing population in Minnesota from 1967 to 2015 of 1.23% per year (Figure 7). Trend estimates for Michigan, Ontario, and Wisconsin were all unreliable for the BBS. Trend estimates for all routes completed in the United States, in Canada, and survey-wide were all increasing significantly. Population trends in the NFB program were significantly increasing in both the Chippewa and Superior National Forests from 1995 to 2016, as well as when the two were combined (Figure 8). The trends were slightly higher in the Superior (2.14% per year) compared with the Chippewa (1.22% per year), but both began to level around 2004. Consistent with the trends, mean population densities were about 50% higher in the Superior National Forest (2.8 pairs per 40 ha) compared with the Chippewa (1.8 pairs per 40 ha). Population density estimates in mature aspen-spruce-fir habitats range from 3.0 to 4.6 pairs per 40 ha in the Chippewa and Superior National Forests, respectively. Mean densities in mature mixed swamp conifer forests were higher and ranged from 5.0 to 6.9 pairs per 40 ha in the Superior and Chippewa National Forests, respectively. This was opposite the pattern from that observed in aspen-spruce-fir habitats. 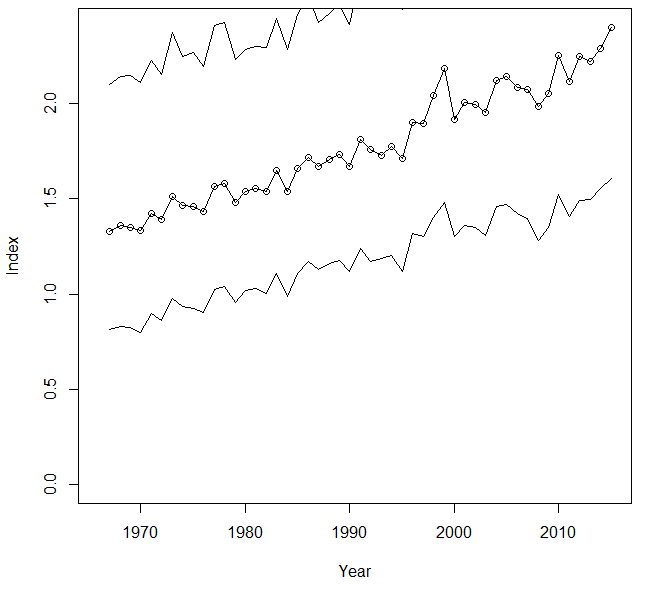 Breeding population trend for the Northern Parula in Minnesota for 1967–2015 based on the federal Breeding Bird Survey (Sauer et al. 2017). 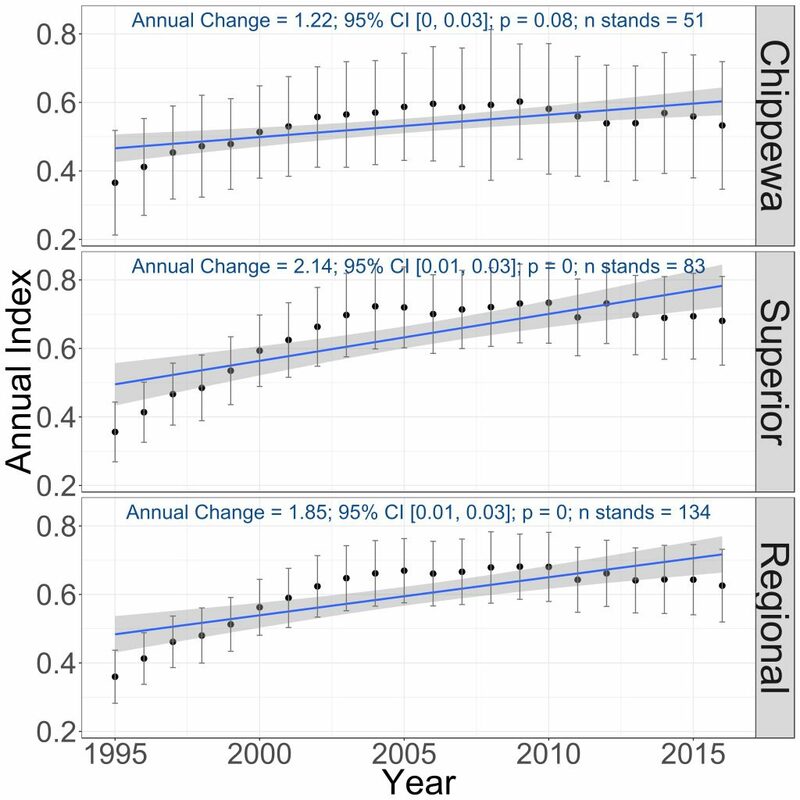 Breeding population trends of the Northern Parula in the Chippewa and Superior National Forests and the combined regional trend, 1995–2016 (Bednar et al. 2016). With a continental conservation score of 8/20 (Rosenberg et al. 2016), there is currently little concern about the Northern Parula. This species, as do all long-distance migrants, face continued threats from obstructions along migratory pathways such as towers, windows, and other manufactured structures as well as suitable stopover habitat between breeding and wintering areas. Longcore et al. (2013) identified the Northern Parula as the seventh most frequently killed bird at communication towers in the Peninsular Florida region. Maintaining appropriate mature forested areas in riparian situations, bottomland areas, and management of conditions that allow epiphytic mosses to grow are critical needs (Moldenhauer and Regelski 2012). The Northern Parula has been documented as susceptible to excessive fragmentation based on studies in the eastern United States, where Robbins et al. (1989) reported the species was rarely found in forests less than 100 ha. Because of its wide distribution throughout the Eastern Temperate Deciduous Forest Biome, the Northern Parula was not identified as susceptible to future climate change (Langham et al. 2015, National Audubon Society 2015). Collins, Scott. L. 1981. “A Comparison of Nest-site and Perch-site Vegetation Structure for Seven Species of Warblers.” Wilson Bulletin 93: 542–547. Freemark, Kathryn, and Brian Collins. 1992. “Landscape Ecology of Birds Breeding in Temperate Forest Fragments.” In Ecology and Conservation of Neotropical Migrant Landbirds, edited by John M. Hagan III and David W. Johnston, 443–454. Washington, DC: Smithsonian Institute Press.